Isn't gold yellow, after all? So what is "white gold"? Back before World War II, folks really like wearing white metal jewelry because it looked so good with diamonds--so diamond rings were commonly made of platinum. 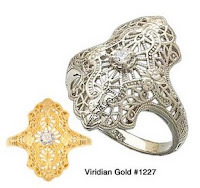 For instance, this beautiful Victorian diamond ring would probably have been made of platinum back then, but now you can get it in 14K white gold (or yellow, if you prefer!). But, when WWII broke out, platinum was restricted to government use, so jewelers introduced "white gold." Now, as you recall, gold used in jewelry is always mixed with other metals for strength. So, 14K gold means that the piece is about 59% gold, and the rest is other metals. Those metals can be chosen to make the piece take on a different color, and for white gold, those alloy metals are varied combinations of copper, zinc, nickle, aluminum or palladium. There are many variations of alloys of white gold used by various jewelry manufacturers, but until recently, all of them have required a plating of rhodium to make them look truly "white". 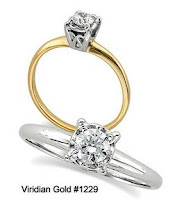 Without the rhodium plating, most white gold has a slight yellowish tint (not surprising, eh?). However, lately a few jewelry manufacturers have produced new white gold alloys which do not require rhodium plating, a real break though, given the astronomical price of platinum nowadays. For instance, Stuller (a highly respected wholesaler and manufacturer of jewelry) has introduced their so-called X-1 14K white gold alloy which does not require rhodium plating. Stuller, by the way, is one of Viridian Gold' suppliers, so we are proud of their accomplishment! One thing that white gold is NOT: It is not just yellow gold with rhodium plating! So, a jeweler cannot take a yellow gold item and simply plate it with rhodium, and then legally claim it is "white gold". I have read of unscrupulous jewelers who have attempted this, but it is fortunately uncommon! 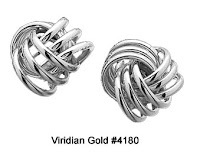 Of course, all of our white gold jewelry at Viridian Gold is real white gold! Like the beautiful #4180 love-knot earrings shown here. 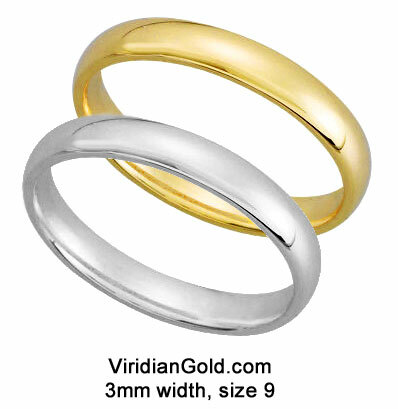 And, many of our items can be ordered in either white or yellow gold versions!